Get your website LIVE in 2 weeks. We cater to small businesses by providing a complete web service to: Design, Host & Maintain a professional on-line presence at a price you can afford. Providing services that save you time! Mobile websites are an essential tool for any business that needs to display information to mobile device users. Business owners do not have time to learn online website builders....Nor do they need the aggravation! Even though these online programs are created for novices, there is still a learning curve , which requires alot of time and causes alot of frustration. and we can have your business online in less than 2 weeks.....and give you 60 days to pay*! If your current website is not Mobile Friendly call or request here. We offer 60 days same as cash (50% down) to help small businesses get their sites Mobile Friendly right away. If the mobile market is important to your business choose one of our "EZ Start" Packages. We can have your business online in a matter of days! On April 21, 2015, Google released a significant new mobile-friendly ranking algorithm that is designed to give a boost to mobile-friendly pages in Google mobile search results. The change, which will take about a week to complete, is so significant that the date it actually happens is being referred to by a variety of names, such as mobocalypse. All website owners, that desire business from mobile phone users should test to see if Google considers their web site to be mobile-friendly by using Googles Mobile-Friendly Test tool. The algorithm started rolling out on April 21st and will take a few days to a week to complete globally. Read more about how this will affect your business rankings with Google here. The best way to see if your web pages are mobile-friendly is to check the Mobile-Friendly testing tool from Google. We can convert your exisiting website and give you 60 days to pay for it. 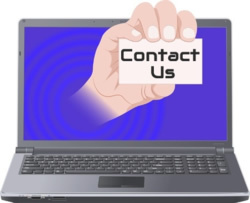 If you need a computer upgraded or repaired or if you are ready to purchase a new or used laptop we recommend our friends at Atlantech Computer Services. .
We can register your domain name, design your website and host it. Leaving you free to do what you do best. We will have your site LIVE in less than 2 weeks.